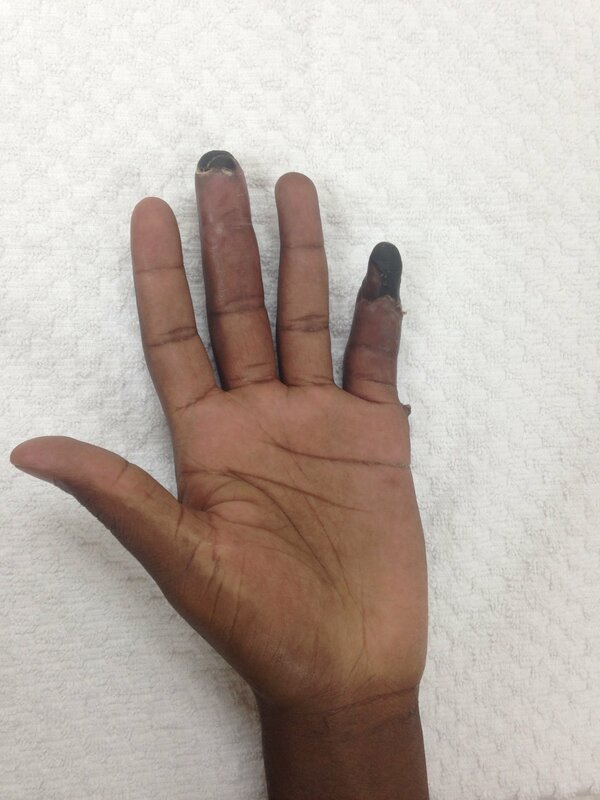 I met this young kid last year that came to my clinic with injuries to his small and long finger. They were covered in a thick black scab…it looked like burns to the tips of his fingers, but not your typical burns that I had seen. Now it’s not that I treat a ton of frostbite injures to know but I studied it at some point. 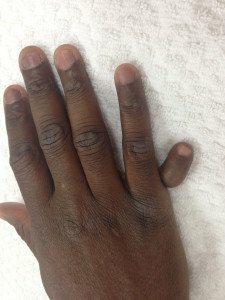 Frostbite finger injury in Miami? I was so surprised and asked him how is it that I have a frostbite injury in my office in Miami when our winter consisted of 70 degree weather. Turns out that he was doing some training somewhere up north. He didn’t have the appropriate attire for winter and it got really cold. 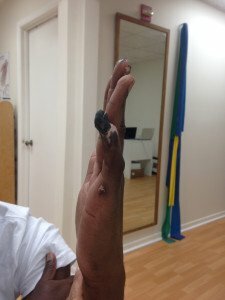 He went to open some metal doors of a truck without gloves on, burned the tips of his fingers without really even feeling it until about the next day. I don’t think he even really thought about it for another couple of days until the pain started in and his fingers started to stiffen. Of course by the time he went to the hand doctor, his fingers were really stiff. There was not much that could be done for the burnt areas except to be kept clean and dry and wait for the dead black skin to fall off. Certain areas, we were able to pull and cut off so it exposed the healed finger underneath. My little friend only was able to come 2 or 3 times so we can follow up on his healing, make sure he was doing his home exercises correctly, and advance him where we could. The small finger was the worst. It was so hard and it never seem to give much at all when it was pushed. He sort of disappeared what seemed like 2-3 months only to appear at my door one day surprising me with a visit. Turns out the little finger did not heal well as there was so much dead tissue. He ended up needing an amputation of the small finger right before his middle knuckle. It was for the best…yes he’s missing part of a finger, but with the amputation, he was able to be very functional with that hand again without the tip getting in the way. 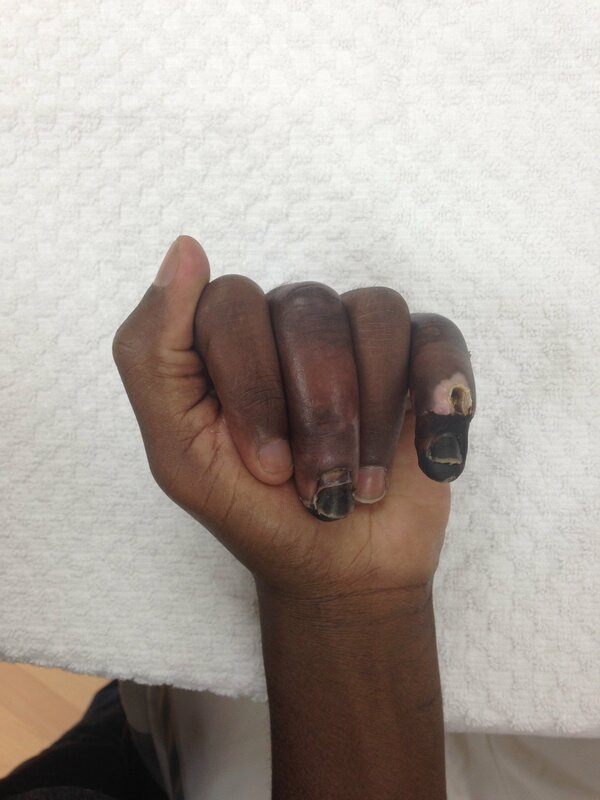 He was not sensitive at all, was able to recover his grip strength, and was back at work in no time! My little friend also was interesting because he had a 6th finger! People who have an extra finger are polydactyl. There are several types but he had it on the side of the small finger. It was not functional meaning it didn’t have bones in it, but he had nail that grew like normal! He had it on both hands but when he was a baby, his mom cut it off on one hand, but didn’t cut if off on the other. It never bothered him or got in his way. If anything, he said the girls always liked it! A little charmer he was. Do you have any frostbite stories to share? Please comment to share! I don’t sorry! Just know about occupational therapy and hand therapy!